A couple of weeks ago, we were contacted by the community manager for Mission Product. He wanted to know if we might be interested in testing and reviewing their line of athlete-oriented skincare products. Of course we said a resounding “yes” (who DOESN’T love free samples? ), and a few days later, the products appeared at my door. “When ultra-endurance athlete Charlie Engle came to us to talk about running across the Sahara Desert, it was clear that he was the definition of an athlete on a MISSION. Teaming up with scientists and skincare industry veterans, we’ve established an entirely new category — high-performance, athlete-engineered skincare™. Engineered in MISSION Labs, the entire MISSION Product line is designed, and has been proven, to meet the specific needs of athletes and sports enthusiasts across all sports. By agreeing to test and review these products, the staff here at Bikecommuters.com has joined the ranks of sports greats such as NBA’s Steve Nash, pro triathlete Hunter Kemper and gold-medal Olympians Mia Hamm and Amanda Beard. Wait a minute…what do WE have in common with world-class athletes? Well, not that much. But, even if you ride a bicycle solely for transportion and not for fitness, you’re exposing yourself to wind, sun, cold and muscular stress. Do you ever come home from a long day of work feeling tired, chapped and sore? Wouldn’t it be nice to protect your skin, your “saddle area” and your lips from the ravages of the elements? 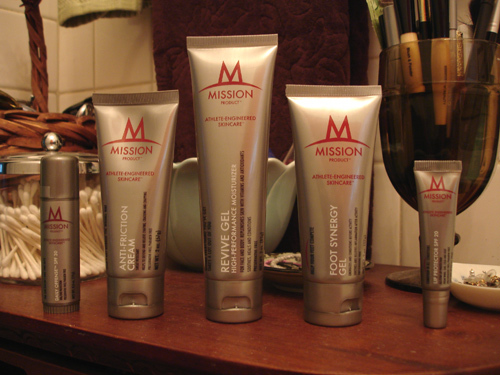 That’s where Mission products step in. 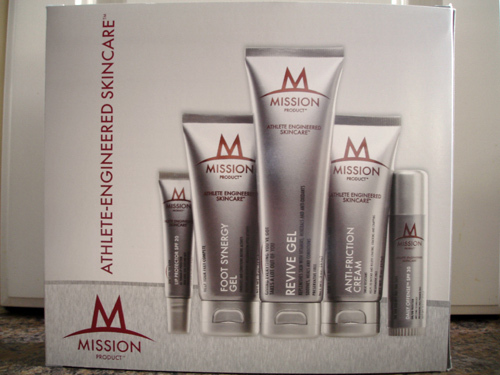 The five items that came in the pack were “Daily Offense SPF 30 Stick” sunscreen for face, ears and anywhere else, “Lip Protector SPF 20” for the lips, “Revive Gel” to moisturize sun- and wind-burned skin, “Anti-Friction Cream” for the saddle area or anywhere else hotspots appear and “Foot Synergy Gel” to soothe tired, aching feet. All of the products are preservative-free and free of PABA and parabens…and are cruelty-free (always a plus in my book). Several of the products are scent-free, too, and those with scent have a mild, pleasant fragrance — you’re NOT going to smell like the perfume counter at Saks Fifth Avenue after applying these products (another plus)! We’re excited to try these products, and we’ll be posting some first impressions as well as long-term reviews, so stay tuned for that.